After the original closed-ring toe ring design was launched in its initial days and became a huge fashion trend that still lasts today, there were some wearers whose feet could not adapt to this one size fits all style of toe rings. Either their toes were too large, too small, or didn’t fit quite right. Whichever was the case, wearers would experience a pinching sensation if the toe ring did not fit properly and their feet were larger, or would have a loosely fitting toe ring that rubbed their feet causing discomfort, sometimes even blisters. Those who had the experience of loose fitting toe rings also stood a good chance of the rings coming off and being lost while walking. A solution to these toe ring problems was an adjustable style toe ring. Adjustable style toe rings come in a variety if metals, including silver and gold for more expensive and pricey toe rings. Some are made of standard, cheaper metals and can be found in department stores and boutiques, but these cheaper adjustable toe rings often do not have the lifetime of ones made from precious or semi precious metals. There are some made of a plastic nylon styled band that is clear with decoration, stones, or beading on top and are adjusted similar to that of a cloth tie-on bracelet. 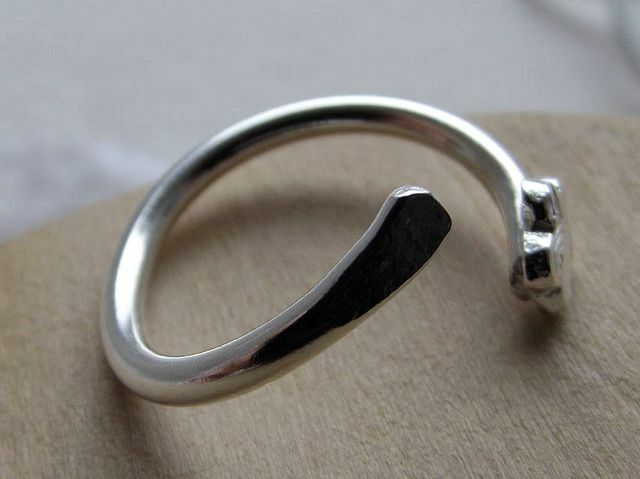 These particular adjustable toe rings can be easily broken if the wearer is not careful. Others are made of wire and are less pricey than their metal counterparts. Adjustable toe rings basically come in one of two styles if made of metal. There’s either a gap at the bottom of the metal band that falls on the underneath side of the toe, or one that is at the top of the ring on the side facing skyward while being worn. The type that closes on the bottom side of the foot is more apt to pinch the wearer than the other style, as it can become loose or tight as the wearer walks. This type is also easier to bend and damage than the other style. Pinching can also result from the style of shoe that is being worn with this type of toe ring. The style that closes on the upward-facing side of the foot often has jewels or little metal embellishments as a part of the enclosure, so these styles tend to be more on the elaborate side. Many toe rings of this style feature charms or birthstones. As toe rings go, this particular style can be the easiest to adjust and the most comfortable to wear for people with all foot sizes. Adjustable toe rings are sold at jewelry stores, department stores, boutiques, mall kiosks, and online—basically anywhere other types of jewelry are sold.